When it comes to winter, I have a love-hate relationship with the season. I love how my neighborhood looks picturesque covered in a blanket of snow. I love getting together with friends for a mean snowball fight. I love walking down the street and feeling the crunch of yesterday’s snow under my feet. What I don’t love is how dry and tight my skin feels just from spending a few minutes outdoors. I have said this before, skincare is very important to me. After all, you only have one face so you’d better take care of it. When it comes to winter, hydration is essential. If you follow me on Instagram story or on Snapchat, you will notice that I always make sure my skin is hydrated and taken care of before I apply any makeup. 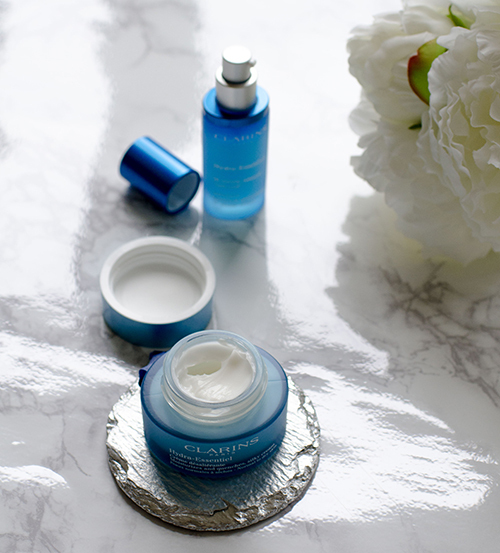 Recently Clarins launched their newest line that goes beyond hydrating your skin – it super quenches your skin by protecting it from the sudden temperature changes it’s exposed to and leaves it looking radiant. Between going to my Pilates class, seeking shelter at numerous coffee shops in the city, and attending numerous events, my skin is constantly exposed to thermic shocks, sudden temperature changes and humidity, and constantly taxing my skin’s hydration. Basically, my skin gets super thirsty and has difficulty retaining any moisture for all day hydration. The new Hydra-Essential line is exactly what I need to protect my skin and boost its ability to retain moisture throughout the day. 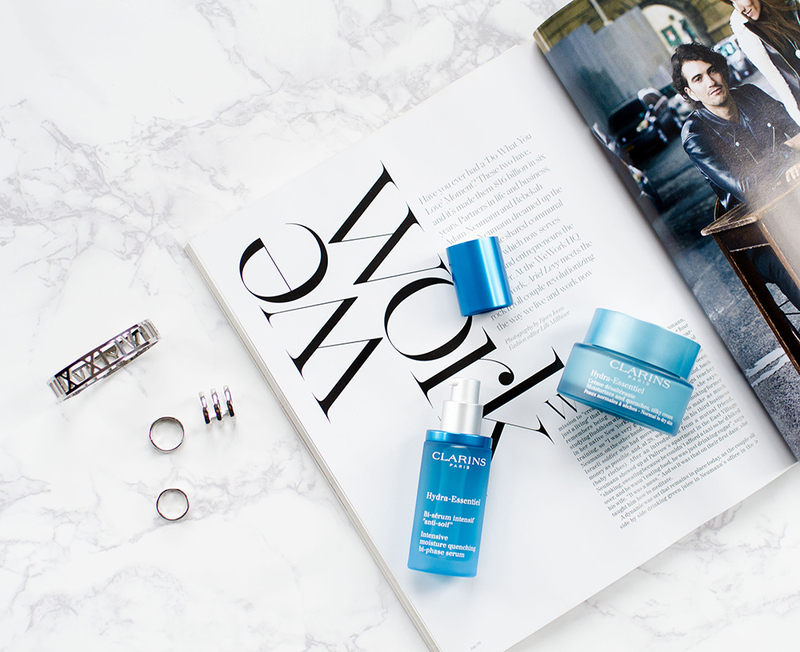 Clarins Hydra-Essential Bi-phase Serum – this lightweight serum is just the thing your skin needs to protect it from dehydration and the daily effects of thermic shock. After a few days of using this serum, I noticed the areas around my eyes, lips and cheeks looking plump, radiant and hydrated. 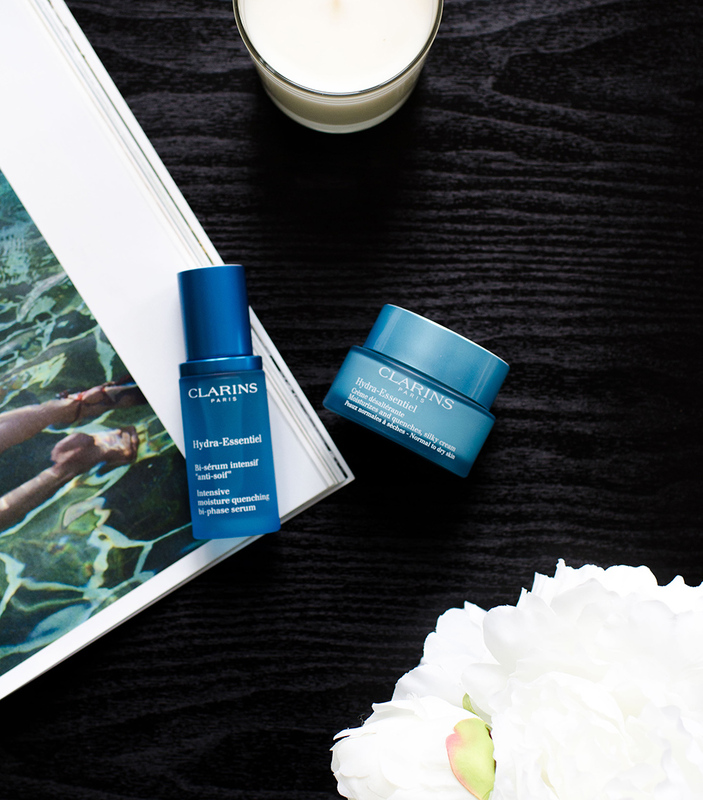 Clarins Hydra-Essential Silky Cream – this luxurious silky cream is exactly what my your skin needs to lock in the serum and keep it quenched throughout the day. After a few days, I noticed a decrease in fine lines and tightness around my forehead, cheeks and the area near my eyes. I like Clarins and your review is so good that I will try this new cream out! Thank you for sharing! And I love your photos, btw! Thanks so much for sharing these products! I am a big fan of Clarins. These sound like the perfect products for the winter! My skin definitely needs that extra hydration, so I’ll have to check these out. Love the packaging, too! Thanks for sharing your review! I love Clarins and these sound like great products for the Winter! These are such beautiful photos too! The details on the Clarins product is so amazing! Love it! Adding these on my to-buy list now! More recently, I discovered how important it is to take care of your skin, especially during the Winter. Clarins sounds like a great line of product! Thank you for sharing! Love this post! What an awesome product! Stay fabulous darling! Great review hun, shedding light on the important facts. My skin certainly needs that additional hydration, so I’ll need to look at these. Adore the bundling, as well!